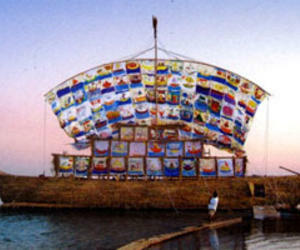 The ship of tolerance, a humanist project by Russian-American artists Emilia and Ilya Kabakov, will be one of the attractions of the 11th Biennial of Havana, to be inaugurated on May 11. These creators have already shown this piece in Venice, Switzerland, England, Egypt and the United States. It consists of a ship, the sails of which are designed by children of the places it puts in at a port. Emilia Kabakov pointed out that this time, when the ship is placed in green areas of the Real Fuerza Castle, designs will be in charge of Russian, American and Cuban children, in a metaphor of peace, encounter of cultures and harmony in which human beings can live. She highlighted that ships were among the first means with which men began to communicate and know each other, and that they use them in this sense of solidarity and knowledge of different cultures. The promoters of The Ship of Tolerance are among the prominent figures of contemporary Russian art, the main objective of which is to make people reflect on how the different cultures interpret the concept of tolerance and how these concepts superimpose, with many points of contact. As customary since its first activity in 2005, in Egypt, the children and youngsters who get involved in this artistic creation take part in debates about tolerance and diversity, and create drawings to hang them on the ship’s masts.